C.N. 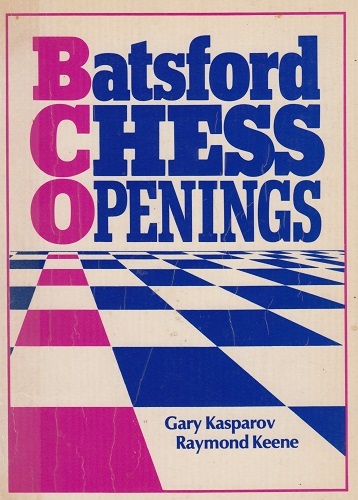 331 questioned the exact role in Batsford Chess Openings of Garry Kasparov, who was referred to as a co-author. 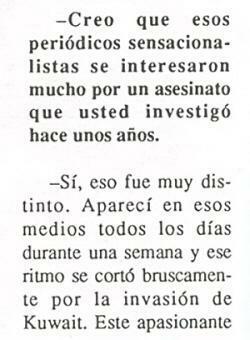 In a letter dated 16 September 1983 (published in C.N. 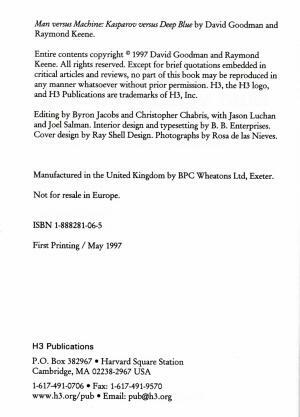 583) Raymond Keene therefore offered us a copy of Kasparov’s contribution, in return for a cheque for £50 payable to a chess charity. We immediately accepted, but no material was ever provided, and nearly two years elapsed before Mr Keene offered us a refund. By then the level of Kasparov’s involvement had been confirmed in two letters received from the book’s ‘Research Editor’, Eric Schiller. Although they were published in full (in C.N.s 844 and 870), Mr Schiller made persistent claims that they had been edited or quoted out of context, a falsehood which he continued to propagate even after C.N. 1737 had reproduced his original letters photographically. 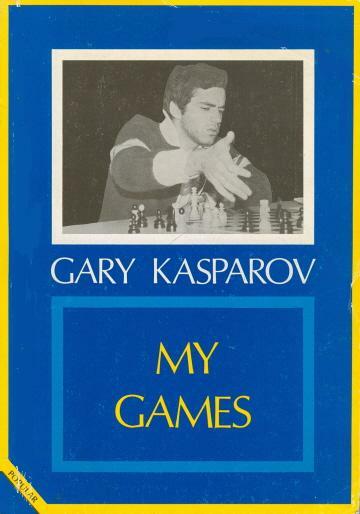 C.N.s 507, 583 and 588 also drew attention to Batsford’s misuse of Kasparov’s name in connection with two other books, Fighting Chess and My Games. Regarding the attempts by those involved in Batsford Chess Openings to dupe the public over its authorship, C.N. 6372 noted that the most recent revelations come in the article Ex Acton ad Astra. Raymond Keene, a contributor [to Chess Express, a new fortnightly newspaper published by Nathan Goldberg], describes the venture as ‘the biggest publishing event in more than 50 years in this country’. This reference is meaningless since there was no other big event around 1930. (In passing, we were far from pleased with the same writer’s claim that the world championship semi-finals were to be ‘the greatest chess event in Britain since 1851’. But Mr Keene, we now realize, is fond of these anti-historical hypes. 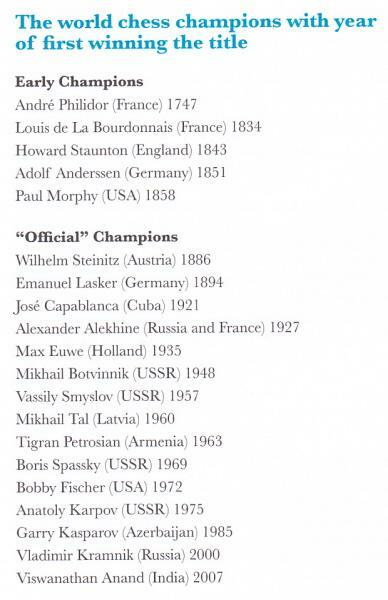 We recall another from page 174 of his (and Levy’s) book on the 1974 Nice Olympiad to the effect that actions of FIDE and Euwe ‘represent the biggest scandal the chess world has seen since Staunton refused to play a match with Morphy’. We hope that this wild dumping of inappropriate comparisons and precedents will stop. Notwithstanding Raymond Keene’s currente calamo praise for Chess Express, the magazine folded after a small number of issues, as noted in C.N. 782. We found it a deeply unimpressive publication. Welcoming and recycling any praise from Raymond Keene suggests, at best, naivety or lack of principle. The match was a semi-final. 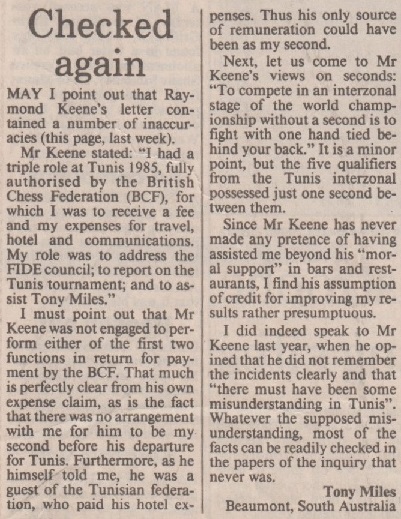 On 16 September 1983 Raymond Keene submitted to Chess Notes a letter in which he took exception to ‘a totally incorrect comment’ which, he alleged, we had made in C.N. 507 regarding the Batsford book Fighting Chess. He asked us ‘to withdraw your damaging comment in the next issue of your organ’. His letter was published in full in C.N. 583, together with proof that, as a matter of plain fact, it was he himself who was wrong. 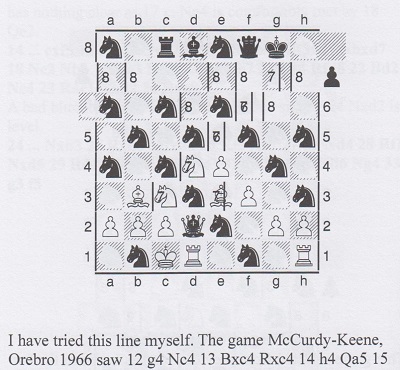 However, as demonstrated by us in the mid-July 1986 issue of CHESS (page 177) and as is clearly shown by the My Games book, it was, once again, Raymond Keene himself who was incorrect. Thus the single example provided by him to support his thesis that we had been ‘bogus and misleading’ was wrong as a matter of public record. Raymond Keene never apologized. The main issue arising out of Docklands Encounter by Raymond Keene and others (the identity of the others depends upon which title page one reads) is not the jarring geography (Yasser Seirawan was not ‘born in England’ but in Damascus) or the hapless history (‘Not since the days of Alekhine has the incumbent of the supreme title captured first prize in so many top events’ – in fact Karpov is well ahead in this respect) or the vapid verbiage (‘Vacations, or holidays as we call them rather banally in Britain, are what you make of them’) or the dubious dogma (Korchnoi is ‘greater even than Lasker at defending and saving difficult positions’) or the gruesome grammar (‘With such diverse membership, there will be obviously be conflicts’) or the ... – but no, one should not dwell on such blemishes in this rapidly produced hardback (‘A Batsford/US Chess Federation book’) which has the same breathless spy-thriller style as Kasparov-Korchnoi,The London Contest: ‘Seconds before the event was due to start it was realized that the boards and sets had not arrived. However, swift telephone calls to the Pentagon, the Vatican and That’s Life solved the problem with minutes to spare.’ In short, much of the background material is garbage, or rubbish as we call it rather banally in Britain. Far more important than this tinselry is the fact that for the first time a book has gone all the way in publicizing the sponsor of an event. 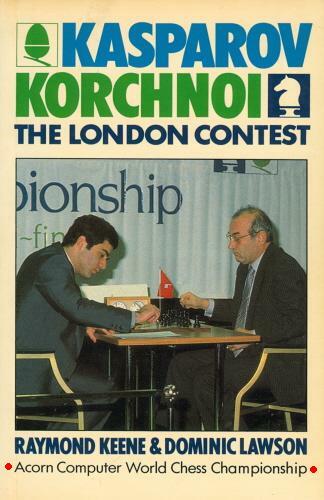 It is true that The London Contest paved the way, notably with a front cover that boldly stated ‘Acorn Computer World Chess Championship’ (thus proving that what counted was the sponsor’s name and not a correct description of the event), but Docklands Encounter goes much further. Chess fans are even offered three gripping photos ‘View across Millwall Dock’, ‘The proposed STOLport site at the Royal Docks’ and ‘Northern and Shell’s spectacular new building on Millwall Dock’. The book starts with eight and a half pages of history of Docklands that show signs of having been stitched on as an afterthought. Our question to readers is whether we are alone in feeling ill-at-ease about such prominence being given to a sponsor. Is there a case for saying good luck to sponsors in securing all the publicity they can by any means, or do readers share our opinion that books should not be over-run with advertising matter? Final remarks: the bibliography acknowledges the work’s debt to The Decline and Fall of the Roman Empire. The annotations are of the Anmerkungen von E. Bogoljubow kind mentioned in C.N. 698. From the dust-jacket (which, surprisingly, features the Docklands) we learn that the author is ‘a regular commentator on BBC-2 chess programmes’. 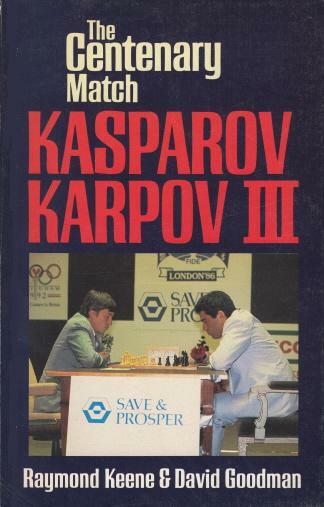 The Karpov-Kasparov world championship match was terminated on Friday, 15 February 1985; just 11 days later we received our ordered copy of The Moscow Challenge by Raymond Keene. Batsford’s speedy publication (and, let it not be forgotten, distribution) is a remarkable tour de force. The historical matter is not egocentric, it is simply inaccurate. Page 1 gives the wrong starting-date of the 1927 championship match; on page 2 Raymond Keene repeats yet again his mistaken claim that New York, 1927 decided Capablanca’s challenger (although we drew attention to this error in C.N. 586); is it true (page 4) that ‘in a recent interview the World Champion recalled that the first chess book he studied was written by the great Cuban’? Not according to the April 1982 BCM, page 159, where Karpov is reported as saying that his first book was Panov’s work on Capa; page 6, Mr Keene will see that his views on Hugh Alexander are wrong if he reads C.N. 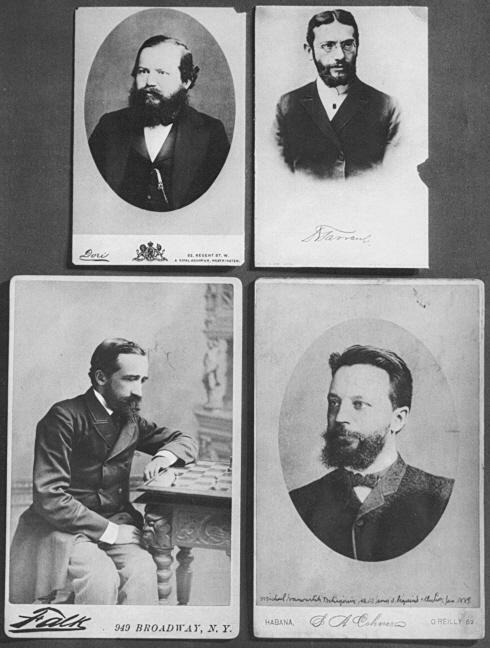 693; pages 7-10, most of the statistics regarding Lasker are false – he played seven world championship matches, not eight; page 9, we are told that it is ‘staggering’ that Steinitz’s tournament record during the period he was champion (1886-1894) was ‘abysmal’. Should a writer not at least check his facts before so criticizing a great player? The truth is that Steinitz did not play in a single tournament during the period under consideration. The Moscow Challenge ends with a hurried account of the closing proceedings. Rather than merely giving a non-specialist article (the piece appeared almost word for word in The Spectator of 23 February), the author might have held on for a day or two more in order to present more thorough and reflective coverage. No doubt the same publishing/writing team will be back in action for the planned K-K ‘re-match’, and we hope to see a vast improvement. Anyone who remains unconvinced by our criticisms of The Moscow Challenge should take a look at page 62, for instance, and decide whether, in all honesty, it can be claimed to say anything of interest or value. 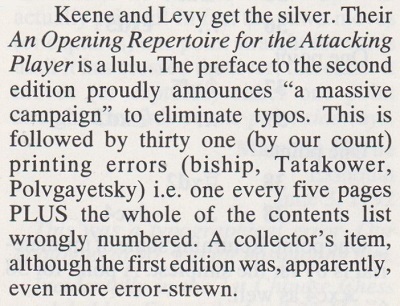 Regarding the remark about Steinitz’s tournament record being ‘abysmal’, we drew attention to the error on page 200 of the May 1985 BCM. On page 256 of the June 1985 issue Mr Keene responded with the astounding claim that ‘in calling Steinitz’s tournament record “abysmal” he was criticising it on the grounds of lack of activity’. 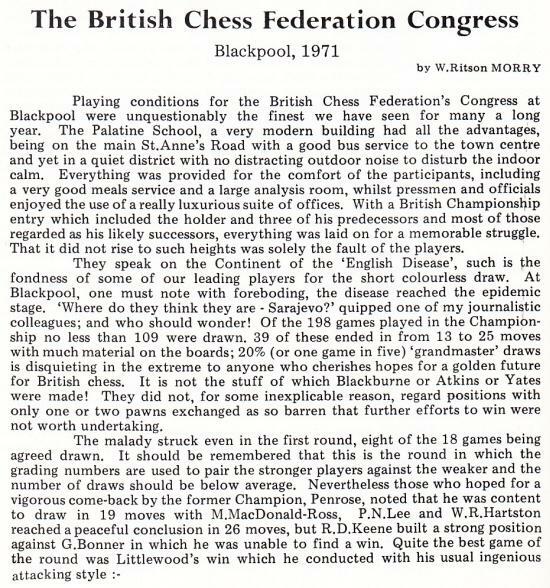 By that logic, we pointed out on page 305 of the July 1985 BCM, Fischer’s post-1970 tournament record could be labelled ‘abysmal’. Mr Keene’s ignorance of Steinitz was also demonstrated on page 35 of his volume Duels of the Mind (London, 1991), where he stated that Steinitz published a book called Modern Chess Theory. No such work exists. On page 60 of the 2 November 1991 Spectator Raymond Keene stated that Steinitz died in 1901. Can readers help us collect examples of writings which state the opposite of the intended message? In the Preface to Becoming a Grandmaster (London, 1977) Raymond Keene says he would be pleased if his GM title did not help others involved in a similar quest. How many games were played in the 1927 world championship match? 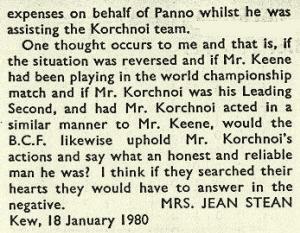 The obvious reply is 34, but on page 14 of his 1978 Karpov-Korchnoi book Mr Keene claims 35. As he does again on page 124 ... and yet again on page 138. How self-sacrificing of Raymond Keene to stress the value of memory, given his history. However, that reference is wrong on other matters. The match took place in 1901, not 1900, and Capa’s age should read 13, not 12. Note too the slapdash inconsistency: two different spellings, Janowski/Janowsky. ‘Imagine my delight, then, at discovering the moves of a win by Alekhine against another player of the very highest class, which has so far eluded publication in any of the English language collections of Alekhine’s games. It has been known for some time that Alekhine’s lifetime score against Paul Keres consisted of five wins, one loss and eight draws, yet one of Alekhine’s wins proved impossible to track down. Before Mr Keene becomes even more carried away with his discovery, perhaps we could point out that the Alekhine-Keres game-score is given, with notes by J.H. Blake, on page 483 of the October 1935 BCM. Finding it there took 30 seconds. 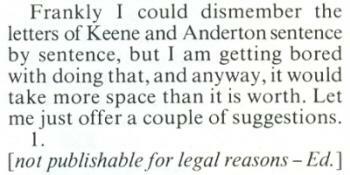 In his public letter of 16 January 1986 to Aly Amin, Mr Keene stated that Karpov had too many privileges, one of which was ‘the right to a revenge match’. Newsflash has a new editor, David Goodman. His first action, it would seem, was to drop the Badmaster column, the only item of permanent value. Mr Goodman has not yet said anything critical about his brother-in-law, Raymond Keene, but no doubt the BCF will insist upon fairness and objectivity. 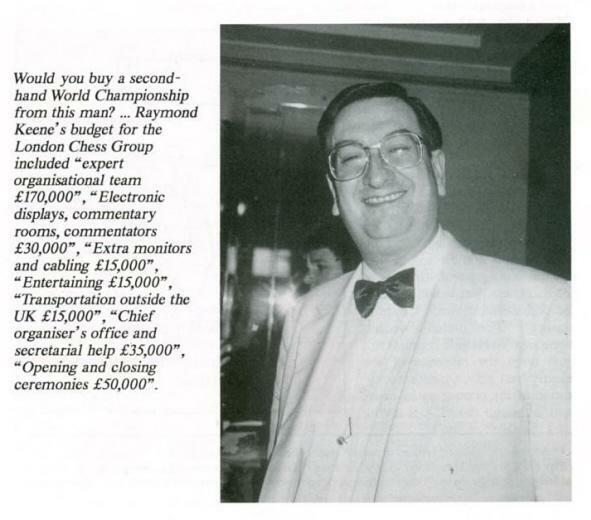 Issue 2 does, however, have an intriguing quote from Mr Jeremy Hanley, the Member of Parliament for Richmond and Barnes: Raymond Keene is the ‘greatest chess Ambassador that Britain has’. It is not indicated which international chess magazines are read by the Member for Richmond and Barnes. Surely not C.N. Nor the South African Chess Player, which has accused Mr Keene of exploiting the South African issue to gain votes. Nor Europe Echecs (France), which has quoted Korchnoi as stating that he has ‘broken off diplomatic relations with that person’. Nor Schacknytt (Sweden), which called one of Mr Keene’s K-K match books ‘en katastrof’. Nor Schach-Echo (Federal Republic of Germany), which has accused him of ‘dancing at too many weddings’. Nor Die Schachwoche (Switzerland), which scoffs at his role in the termination/telex issue. 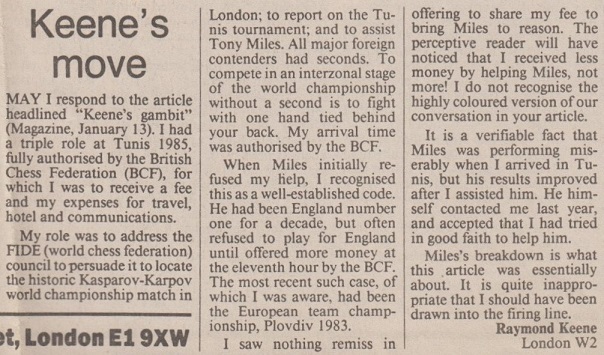 Nor the Myers Openings Bulletin (USA), which reports that ‘Keene’s hypocrisy is not confined to the termination of the Karpov-Kasparov match’. But, above all, the Right Honourable Member should procure copies of the ‘FIDE Facts’ sheets which are being published by the American Friends of FIDE. The result is tawdry. Not a detail is missed of the beloved world champion’s arrival in London (otherwise known as ‘Chess Capital of the World’): ‘... Kasparov was presented with small bouquets of flowers, by Leah, four-year-old daughter of match hospitality officer Adrienne Radford, and Sophie, five-year-old daughter of world championship press chief Jane Krivine ...’ Kasparov was then ‘whisked away’ to his ‘secret address’, just like the hero of some corny espionage film. Two days later Karpov arrived and was ‘driven to another secret London address for a champagne supper’. The preoccupation with ‘exotic’ nourishment is becoming a notable characteristic of Raymond Keene’s writing. Half of page 9 is taken up with the menu of an 1883 banquet, the information being no more interesting now than when Mr Keene printed it in The Spectator of 26 April 1986. On the last page of the match book it is recorded for future generations that in Leningrad Mr Keene was able to tuck into ‘a sumptuous dinner of caviar, stuffed pike and stuffed turkey’. We are in a world in which everything is sumptuous, stunning or triumphant, and where nobody is nobody. The match opened with ‘a stunning ceremony in the Grand Ballroom of the Park Lane Hotel, co-ordinated by Major Michael Parker, fresh from his triumphant staging of the Royal Tournament at Earls Court’. The dispensability of these details is proved by the book itself, for in the Leningrad half the reader is, in the main, spared such frippery. Also absent is a blow-by-blow account of how the Soviet Chess Federation secured its part of the match, what detailed preparations it made, who offered flowers to whom, etc. The impression is thus unwittingly given that what the USSR is able to organize quietly and efficiently can be achieved in London only with top-pitch frenzy. Quite apart from being counter-productive, chauvinism is illogical and distasteful. Why all the talk about ‘British Chess’ during the third Kasparov v Karpov match from people who never once referred to ‘Italian Chess’ at the time of the 1981 ‘Massacre in Merano’? The co-authors miss no opportunity to criticize Campomanes; since Mr Keene states in the September CHESS that Batsford is supporting his (RDK’s) political campaign, there is no surprise in that. The cover photo (K and K at the board, surrounded by advertising placards) strongly suggests that FIDE will have to tackle the question of whether the dignity of chess is not impaired when venues start to resemble Brands Hatch. Incidentally, it is interesting to note in that photograph that the Greater London Council (which put up over £600,000) receives no exposure at all. Having been disbanded, it is of no further use to ‘British Chess’. One historical point. As reported in C.N. 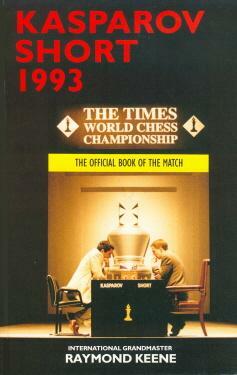 1029, we showed in the 1985 BCM that the 1909 Paris match between Lasker and Janowsky was not for the world championship. This was corroborated by Kenneth Whyld in the August 1986 BCM, page 373. And on page 331 of that same issue the Editor gives a list of world title matches and adds that ‘many recent sources give here a ten-game match Lasker v Janowski, Paris 1909, but the best authorities do not include it’. Exactly so. On page 6 of their book Keene and Goodman do. There follows a further example of Raymond Keene’s toxic imprecision. ‘1. I have not written, printed or issued election literature of any kind. 2. I have no connection with the American friends of FIDE. 3. I have not been campaigning for Campomanes. Raymond Keene made no retraction of his falsehood. The 19/26 December 1987 issue of The Spectator contained a chess history/trivia quiz set by Raymond Keene. Of the 30 questions, under half could be called correct. Some were pure fiction, others had more than one answer, and others still were sheer speculation. John Roycroft has kindly authorized us to say that he has no quarrel with this assessment. We are most grateful to him; after all, Mr Roycroft was one of the three prize-winners. The Batsford annotations have a style all of their own – pure rodomontade. A ‘colossally fascinating’ variation here (game 5), an ‘incredibly minor infringement of normal practice’ there (game 7). That the annotator can do better is admirably shown by games 12 and 14. The 11-page introduction has little to do with the match, but purports to explain why Campomanes was not defeated in Dubai and how the Grandmasters’ Association resulted. Although commendable restraint is shown (Marcos is not mentioned until page 4) the material is a colossally unfascinating and incredibly major infringement of basic justice. The blame for not beating the FIDE President is placed squarely on Lucena’s shoulders: ‘ ... not even Lucena’s warmest admirers could say that he was a strong candidate. He was kind, amiable, well intentioned, yes – but no public speaker, no vote winner’ (page 5). On the following page we learn that Kasparov ‘was evidently somewhat underwhelmed’ by Lucena. In reality, of course, it was Tartuffe rather than Orgon who was the hustings turn-off. But in fairness it must be pointed out that even Kasparov is verbally savaged by our objective chroniclers: ‘Perhaps Kasparov was a shade naive, understandably so, when it came to politics’ (page 7). The biased and nugatory introductions to individual games use the familiar hint-and-smear technique, emitting just enough smoke to suggest a raging fire. 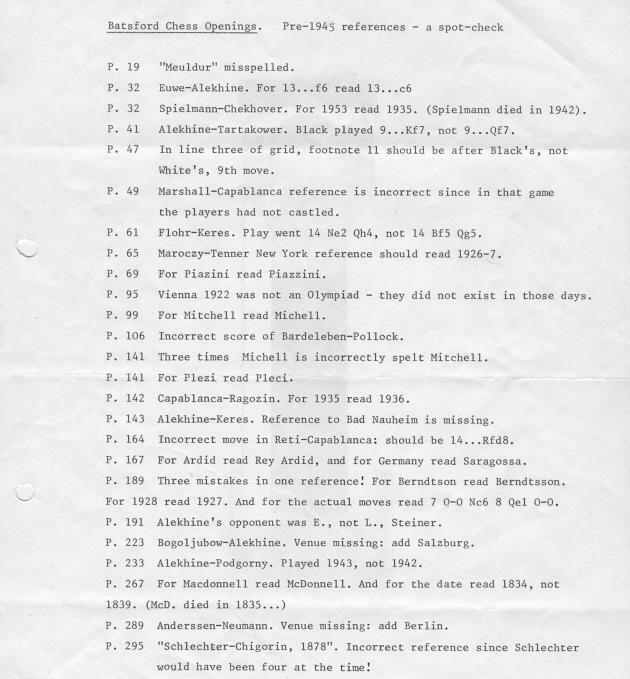 For example, page 92 attempts to persuade the reader that Karpov engineered Tal’s departure from Seville during the match – just one more ‘scandal’ that is dumped in the reader’s lap without a flicker of evidence. One of the few historical references in the book is on page 62, where we are told that Grünfeld ‘launched the defence which bears his name with a convincing win against the mighty Alekhine’. This, of course, is nonsense. Presumably the allusion is to Alekhine v Grünfeld, Vienna, 18 November 1922, but by that time 1 d4 Nf6 2 c4 g6 3 Nc3 d5 was no longer a novelty. One earlier game, though probably not the first, in which Grünfeld played these moves as Black was against Sämisch in round seven of the Pistyan tournament in April 1922. As ever, we are at a loss to describe adequately Mr Keene’s handling of chess history; there is no entry for ‘Midas touch’ in our dictionary of antonyms. The December 1988 CHESS (page 36) published an advertisement soliciting subscriptions to Raymond Keene’s English Chess Association. It featured a quote (about the Association’s good intentions) which was attributed to the ‘Encyclopedia [sic] Britannica’. CHESS readers will doubtless have been impressed that a reference work of such stature has given recognition to the ECA. The truth is rather different. The quoted words are not from the Encyclopaedia Britannica at all, but from the 1988 Britannica Book of the Year (page 319). The writer there? Raymond Keene. This perpetuates the misrepresentation described in C.N. 1765. The reference to the ‘Encyclopedia Britannica’ is an untruth and, in any case, the ‘heartening ... recognition’ was from the pen of none other than the founder of the Association. Page 114 of Deep Thinking by Garry Kasparov with Mig Greengard (New York, 2017) quoted that passage, adding a wry comment. All reference books claim that Frank J. Marshall died in 1944, but the consensus has now been broken by Raymond Keene in The Complete Book of Gambits. Page 81 has a game which is headed ‘Lewitzky-Marshall, Breslau 1991’, and page 184 presents ‘Marshall-Duras, San Sebastian 1991’. 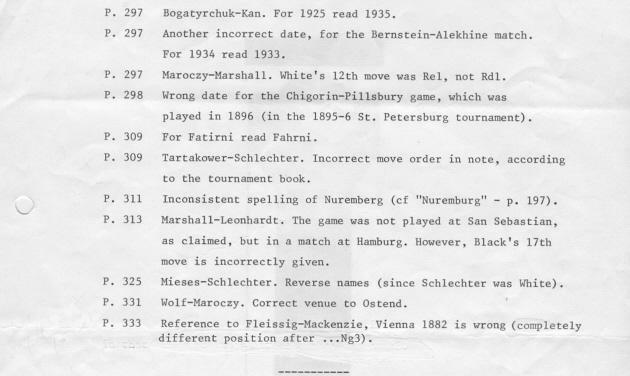 The book naturally has many other clangers, such as the statement on page 31 that it was Tarrasch, rather than Alekhine, who won their game at Pistyan, 1922. The entry on Hans Fahrni by Raymond Keene in Golombek’s Encyclopedia (hardback and paperback editions) stated that in 1909 the Swiss player won a tournament in Monaco. The place in question is Munich. The mix-up presumably stems from Monaco in Italian meaning either Munich or Monaco. There was no correction, however, of the bizarre spelling ‘Maitrer’. In this famous Schlechter game Black was Meitner. 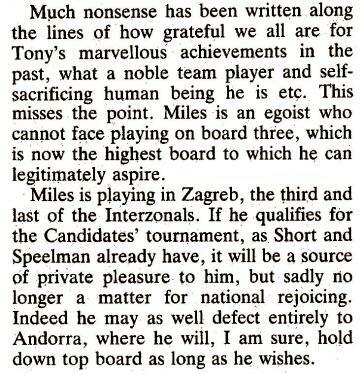 As shown in our ChessBase article posted on 12 November 2011, Tony Miles informed us in a letter dated 15 July 1989 that he was working on a project under the inspired title Raymond Keene: A Reappraisal. Sunday Times, 17 February 1991, page 23. Raymond Keene, The Times, 16 November 1991 (Saturday Review, page 53). As shown in FIDE Championship (1928), the Federation did not suggest that its tournament was any kind of world chess championship. Moreover, the event took place in The Hague, not Amsterdam. 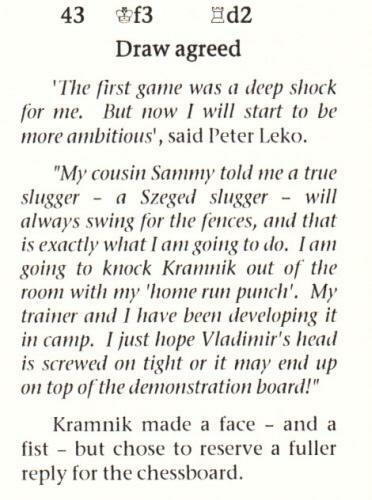 Source: BCM, May 1993, page 231. 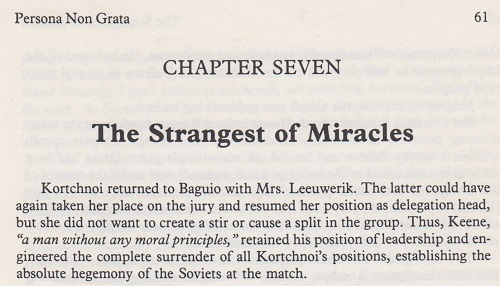 On page 44 of From Baguio to Merano by A. Karpov and V. Baturinsky (Oxford, 1986) Karpov referred to Raymond Keene’s ‘sharply unpleasant traits’. The result of Raymond Keene’s attempts at personal advancement is public decline. In a letter to us dated 23 July 1993, the Editor of The Times, Mr Peter Stothard, professed that it was his newspaper’s practice to correct errors in print. When, however, further factual inaccuracies were brought to his attention, Mr Stothard became uncommunicative. Source: article by Ian Murray on page 4 of The Times, 18 May 1993. 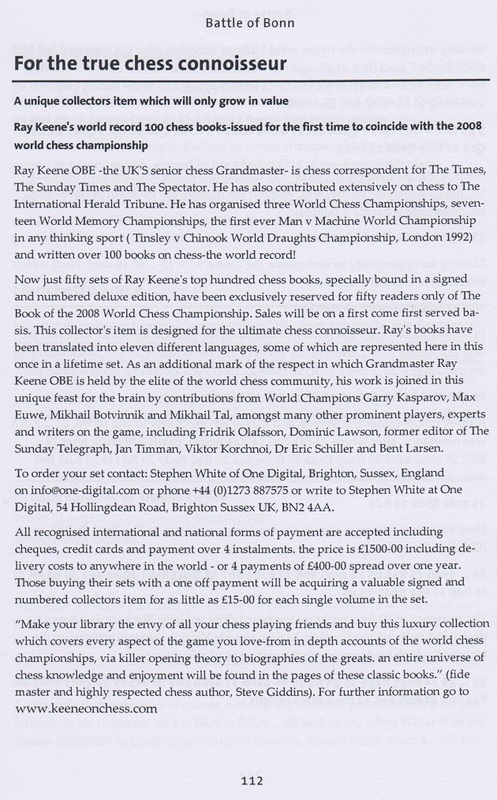 The text by Ian Murray was also reproduced on pages 5-6 of The Times Winning Chess by R. Keene (London, 1995). 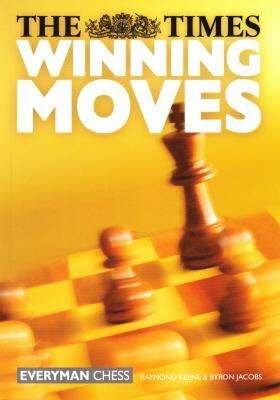 In the United States that book was published under the title How to Win at Chess (New York, 1995). On page 11 of the 7/1993 New in Chess, Hans Ree described The Times’ reporting as ‘an embarrassing collection of hype and half-truths’. But what about the outright untruths too? A few examples follow. 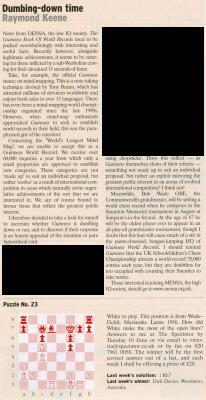 The newspaper’s (premature) announcement, by Daniel Johnson on 31 March 1993, that it had secured the Kasparov v Short match asserted that The Times had offered ‘the largest prize fund in the history of chess’. In fact, it was smaller than the purses for Kasparov v Karpov, 1990 and Fischer v Spassky, 1992. The Times’ frequent references to the closing stages of the 1984-85 Karpov v Kasparov match were flatly false. 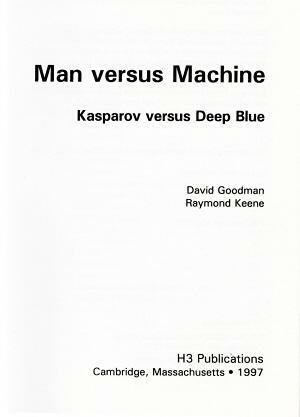 On 27 February Raymond Keene wrote that ‘Kasparov revived and began to win game after game’. On 1 April Walter Ellis claimed that Campomanes had stopped that match as Kasparov ‘began to move ahead of the “approved” champion, Anatoly Karpov’, while a leading article the same day affirmed that the match was stopped ‘after Kasparov had won several games in a row’. General chess history fared no better. 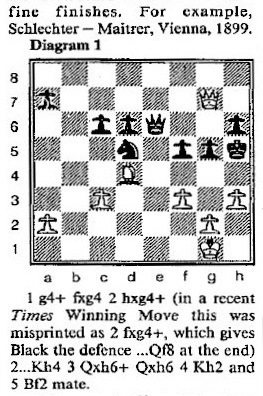 On 26 June Raymond Keene wrote that one of Reuben Fine’s triumphs in the 1930s was ‘share of first prize with Capablanca at Nottingham, 1936’; on 21 August his column claimed that Gustav Neumann won a tournament four years after he had died; on 9 September he erred by 30 years regarding the origins of the Marshall Gambit in the Ruy López. The Times even proved unreliable about itself. On 18 May Ian Murray, after showing total ignorance about the conditions for pre-Second World War world title matches, blundered about the identity of the newspaper’s own chess correspondent in the 1930s. Concerning the Neumann matter, see too C.N. 9791. 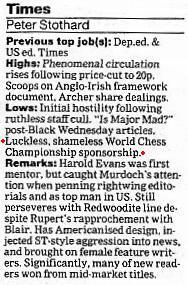 Raymond Keene’s book on the 1993 Kasparov v Short match was reviewed by Leonard Barden on page A56 of the Guardian, 20 November 1993. Barden criticized the ‘hype’, as well as ‘much gloating’ about the financial problems of the rival Karpov v Timman match. Page 3 of Kasparov v Short (Moscow, 1993) stated regarding the Professional Chess Association, ‘this body was grounded in May 1993’. As documented in C.N. 5375, Kasparov later described his decision to break away from FIDE as ‘a terrible blunder, the worst of my career’. Over the subsequent months, coverage became increasingly frantic and mendacious. From our reading, no newspaper’s treatment of chess has ever attained the level of crassness found in the Times throughout 1993. The feature article Cuttings shows many examples, and more will be added in due course. ‘With regard to recent Winning Move chess features in The Times. Monday, 7 January: the position claimed to be from a game between Bogoljubow and Alekhine is fictitious (as indeed was the one based on the same game which was published by The Times on 28 December 1990). 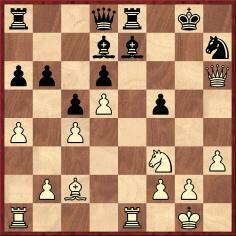 Wednesday, 9 January: the position allegedly from Capablanca v Thomas never occurred. The same day’s feature also gives the impossible move 2 Rxa2 in the solution to Tuesday’s column. Finally, in the solution published on Thursday, 10 January, the reference to “2 Rb8 mate” is erroneous; it is not checkmate because Black can reply 2...Qe8. Where is the logic or sense in that? In the meantime, Mr Keene blunders on. 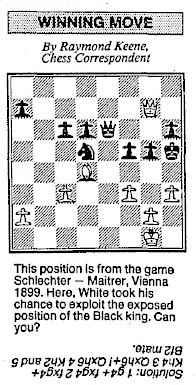 On 29 August 1994 his Winning Move feature published an incorrect position from Mannheim, 1914 and then gave as the actual finish a line that never happened. (The real game lasted over 30 moves more.) For good measure he also mangled the winner’s name, putting ‘Farin’ instead of Fahrni. All that in one little puzzle. What is the solution to the Keene problem? ‘Last several’ means ‘last seventeen’. The sole worth of Raymond Keene’s output is to show who will pretend that it is worth putting out. Quite apart from the mistakes about the Lasker v Thomas game (it was played in 1912 and not 1910, White’s sixth move was not ‘6 12c e4’, and it is hardly an example of ‘White delivering checkmate by castling’, given that Lasker played 18 Kd2), as well as the reference to ‘Gate Kamsky’, a general idea may merit reflection. Game-scores are sometimes accompanied by details of the time consumed by the players. A similar indication would be helpful in each column by Raymond Keene. The one above could be slung together from scratch by almost anybody in the chess world in 15 minutes flat. The difference, of course, is that hardly anybody in the chess world would consider it printworthy. Raymond Keene is less a journalist or columnist than a copyist, propagandist, egotist, fabulist and contortionist. His column-hogging has done immeasurable harm to chess, to his employers and to himself. Page 279 of Kings, Commoners and Knaves (published in 1999) included a comment also written in 1995: ‘Mr Keene will surely triumph again if another such award is offered. 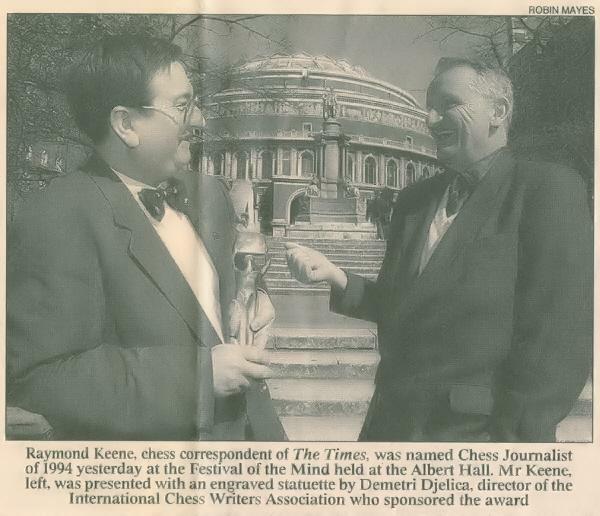 Who else would even consider accepting it?’ From 1995 onwards the ‘Association’ lay low, but it unabashedly turned up again on page 25 of the December 2000 CHESS, which published another photograph of Mr Keene once more receiving a trophy from the egregious Mr Bjelica. 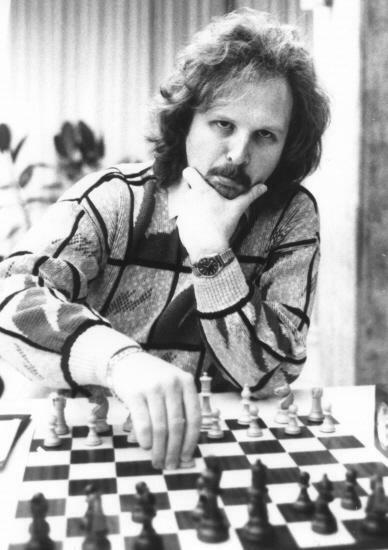 The object was described by CHESS as ‘the “Chess Journalist of the Year” Oscar’, and the magazine’s extensive photo caption indicated that it did not for one moment take the award seriously. 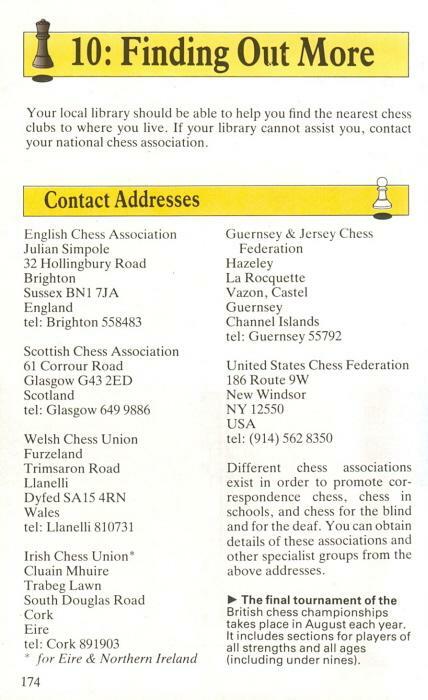 Our records contain no other information on the ‘International Chess Writers Association’ (e.g. its statutes, officers, membership list, voting rules, etc.). On page 121 of Chess An Illustrated History (Oxford, 1990) Raymond Keene describes David Levy, his brother-in-law, as ‘President of the International Chess Association’. The activities and statements of Raymond Keene need to be chronicled rigorously and uncompromisingly. An important function of journalism is pest control. Prime requisites for any journalist are an eye, nose and ear for cant. Source: Sunday Times ‘1000 Makers of the Twentieth Century’, 1991, 13 October 1991. Source: Child of Change, page 14. G.A. MacDonnell is not to be confused with A. McDonnell, affirmed Raymond Keene on page 139 of The Complete Book of Gambits (a steal at £14.50), yet Mr Keene twice misspelt G.A. MacDonnell’s name as ‘McDonnell’ on that same page. The book is no bargain. For the justification of the word ‘steal’, see Copying. Page 237 of the Complete Book of Beginning Chess by Raymond Keene (New York, 2003) asserts that Capablanca’s 1921 feat of winning the world championship without losing a game ‘has never since been repeated’. (What about Kasparov v Kramnik in 2000?) The same book also contains, on page 241, the following information about Alekhine: ‘b. 1882 in Mocow’. In that game Keres was White versus Petrosian. A two-minute check of FatBase 2000 yields a list of games with a white bishop on f8 and a black bishop on f1, and there are 279 of them. Some, though, are duplicates, an example being István Csom’s victory at Esbjerg, 1981 over Raymond Keene. Many further examples of the book’s incompetence are shown on other C.N. pages. 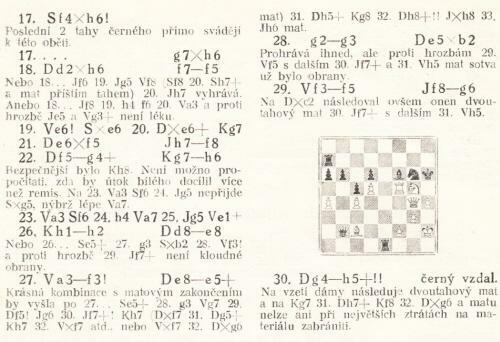 No volume entitled Complete Book of Chess History is ever likely to be published, for obvious sound reasons, but the word ‘complete’ is widely tolerated in the titles of beginners’ chess books. ‘I’m not good at attention to detail’, stated Mr Keene uncontroversially on page 17 of the November 1990 CHESS. Since he is hopeless at chess history, the innumerable factual errors in the 2003 edition of Complete Book of Beginning Chess were mostly, though by no means only, in the last 100 or so pages, in the chapters entitled ‘The Heroes of Chess’, ‘The History of Chess’ and ‘The Best Games Ever Played’. In the 2018 edition no textual amendments have been made anywhere (‘Rèti’ is still the spelling passim), except that, gratifyingly, those three final chapters have been silently removed. There remains the logical conundrum of how the 2003 title Complete Book of Beginning Chess could be retained in 2018 for a new edition which is under half the weight of its predecessor and has deleted about one third of the content completely. Thames Television closed down in 1992. Raymond Keene will take many things, but not pains. 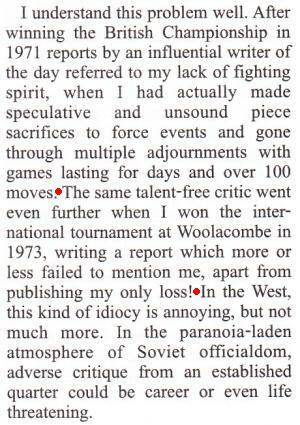 Commenting in his Times column of 24 June 1978 (page 19) about Raymond Keene’s book on the 1977-78 Korchnoi v Spassky Candidates’ match, Harry Golombek wrote that the account ‘is so partial as to fail to carry any real conviction’. 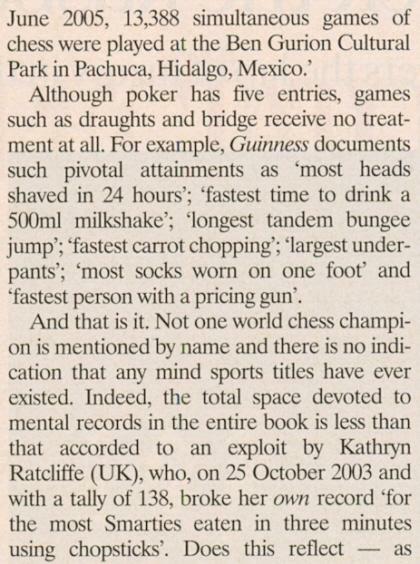 ‘“The world’s biggest-selling book” is the boast on the back cover of Guinness World Records 2007 (London, 2006). 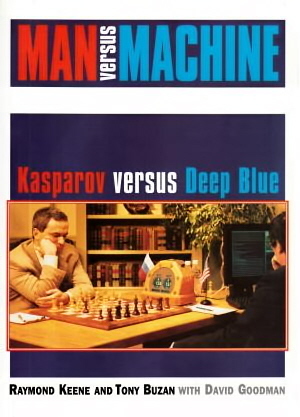 Two pages include entries on chess: page 99 has a couple of dozen words about Sergei Karjakin being the youngest grandmaster, while page 137 offers brief features on the smallest and largest chess sets, as well as the following: “On 25 June 2005, 12,388 simultaneous games of chess were played at the Ben Gurion Cultural Park in Pachuca, Hidalgo, Mexico.” That is all. The four entries from the 2006 edition have been dropped. ‘I therefore decided to take a look for myself to ascertain whether Guinness is dumbing down or not, and to discover if their response is an honest appraisal of the situation or pure hypocritical cant? d) Over a third of ‘his’ article in The Spectator was, in fact, written by us. An apology was too much to expect, of course. There are no limits to what Raymond Keene will shrug off. Raymond Keene no longer makes an effort even to pretend that he is making an effort. 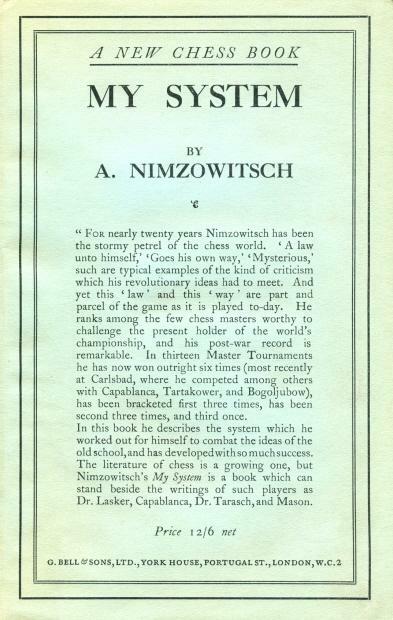 Nimzowitsch’s My System was first published by G. Bell and Sons, Ltd. in 1929 (302 pages), and the company also issued a two-page errata list. Some, though not all, of the corrections were included by Bell many years later in a reset version (265 pages). In 1987 B.T. Batsford Ltd. chose to reprint the 1929 original, but the company’s then ‘Adviser’, Raymond Keene, did not realize this. He added a Foreword (‘Batsford are proud to present this new edition ...’) which mentioned page numbers corresponding to the other Bell edition. The Batsford reprint furthermore revealed ignorance of the errata list. In 2003 Hardinge Simpole brought out a reprint of My System, though it was nothing more than an expensively priced, cheaply produced, reprint of the Batsford reprint, still with ignorance of the errata list, still with the mix-up over the page numbers and, even though Batsford’s name was not mentioned elsewhere, still with Mr Keene’s remark ‘Batsford are proud to present this new edition’. How pride can come into any of this is unclear. ChessBase has never censored anything written by us. ‘... born in England of mixed US and Syrian parentage’. When Warriors of the Mind was re-issued in 2002, the errors were, of course, left untouched. ‘... born in England of mixed US and Syrian parents’. One obvious reason why so many of Raymond Keene’s books contain so many gaffes is that he copies so much from so many of his previous books. Jean Dufresne’s real name was Jean Dufresne. E.S. Freund was his pseudonym. The work was published in London by Kingfisher Books and in New York by Aladdin Paperbacks. Back-cover inscription by Korchnoi on one of our copies of Karpov-Korchnoi 1978 by R. Keene (London, 1978). 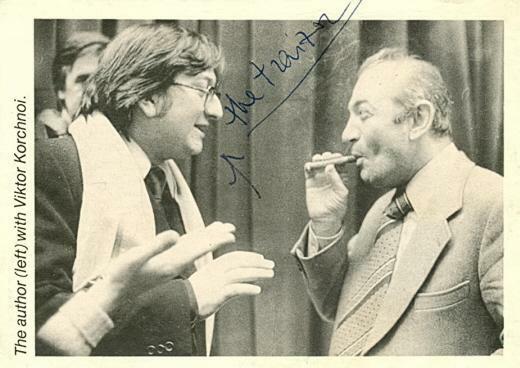 The book is signed by Korchnoi on the title page. 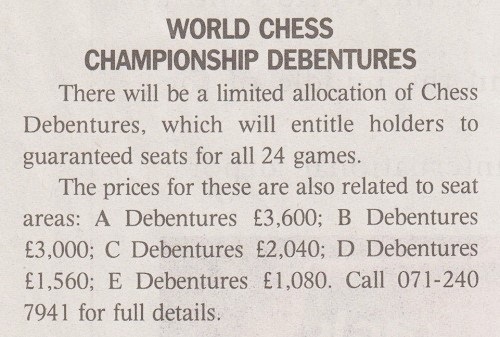 Source: CHESS, September 1979, pages 337-338. 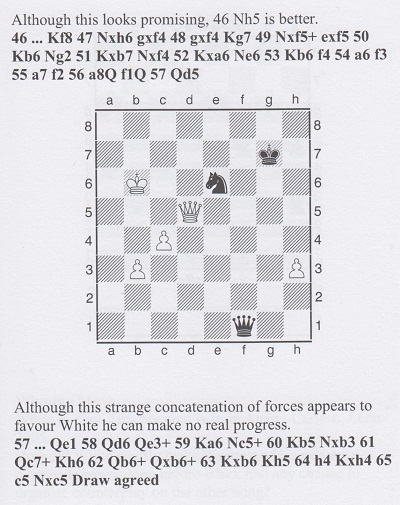 Source: Antischach by V. Korchnoi (Wohlen, 1980), page 109. Botvinnik’s victory over Capablanca in the AVRO tournament is one of the most famous games in chess history. It was played in Rotterdam, and not in Amsterdam as Raymond Keene stated on page 30 of The Sunday Times Book of Chess (Aylesbeare, 2005). The column in question was dated 23 January 2000. In short, Mr Keene asserted that in August 1990 (July 1990 would be correct) he established the area where the body was located but that the murder case collapsed owing to a legal error by the police. Mr Keene considered that a pity because he could have become a millionaire by writing a book on the subject. He concluded by affirming that the defendant had confessed. The lower his self-made pit, the higher his self-made pedestal. 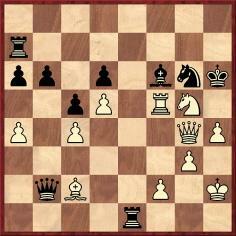 Black to move. Should he castle? Richard Hervert (Aberdeen, MD, USA) draws attention to this position, which would have arisen in the game Spielmann v Nimzowitsch, Stockholm, 1920 if White had played Nimzowitsch’s suggestion of 17 Nf4-d3 (instead of the move actually played, 17 Be3). On page 364 of The Praxis of My System (London, 1936) Nimzowitsch gave various lines beginning 17 Nd3 Qg1+. Except, of course, that White can somewhat untie himself with 18 Bxg5, winning the queen for nothing. Thus apart from the unrecorded forename of Black (‘Ing.’ means engineer, i.e. inženýr), all key details concerning the game were readily available in 1998. 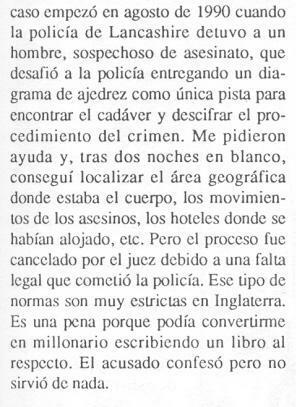 When this game ending was given in the Spanish and English editions of Pablo Morán’s monograph on Alekhine (see pages 337-338 and 262 respectively), it was pointed out that Black was a well-known figure, Juan Lacasa Lacasa. A more general point is that many of the other positions in the 2003 Keene/Jacobs book published by Everyman Chess were mere repeats of what had already appeared in two similar volumes by Raymond Keene for Batsford, The Times Winning Moves (1991) and The Times Winning Moves 2 (1996). For instance, ‘Yanowsky v Toriran, Canada, 1953’ is in the second and third books (on, respectively, pages 78 and 57). The correct information reference is Yanofsky v Tornerup, Copenhagen, 1947. For the details, see C.N. 8175. Even when he helps himself to low-hanging fruit, Raymond Keene goes pear-shaped. Half a dozen typos in half a dozen lines. 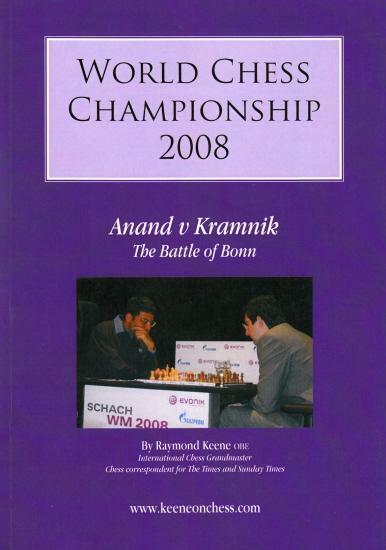 Source: page 12 of a book published by Impala Film Division in 2008: Battle of Bonn (World Chess Championship 2008) by Raymond Keene and Eric Schiller. Has anyone ever been taken in by this? What is the exact origin/source of the ludicrous remark attributed to the Times? Raymond Keene has made himself Tony Buzan’s claqueur en chef. However, it is far healthier to be the subject of Keene’s vitriol than his treacle. On page 5, in the Acknowledgements section, Keene writes, ‘I must thank Professor [sic] Tony Buzan’. His obsession with pseudo-prominenti is laughable. Raymond Keene’s claim that ‘he is the Chairman of the English Chess Association ...’ was repeated in the second (2017) edition of his book on Tony Buzan. Raymond Keene is his own worst enemy. Next come his so-called friends. In the chess world, the number of such ‘friends’ has dwindled dramatically, for obvious reasons. Raymond Keene: a tribal chess writer now bereft of a chess tribe. An article entitled ‘Self publishing’ by Justin Horton dated 23 August 2013 shows that in dozens of Spectator chess columns Raymond Keene has advertised the books of Hardinge Simpole without declaring his status as a director of the company. Voronkov/Plisetsky: 416 dense pages, 175 games. Regarding Raymond Keene’s untrue claims (to the benefit of his associate Barry Martin) about research into the origins of the term ‘grandmaster’, see C.N. 8298 and Chess Grandmasters. Chess Problems, Play and Personalities by Barry Martin (Beddington, 2018) was discussed briefly in C.N. 11186. A new website Keenipedia provides much information about Raymond Keene, including a comprehensive list of his appearances in Private Eye. Despite the overwhelming documentary proof, most ‘mainstream chess journalists’ decline to speak out about Raymond Keene. He used to be ‘too powerful’ to criticize, and now he is ‘too insignificant’. What was the intermediate excuse? The respective dates should obviously be 1993 and 1995. How is the reader to know from such a list that, for instance, Alekhine regained the world title in 1937 and held it until 1946? 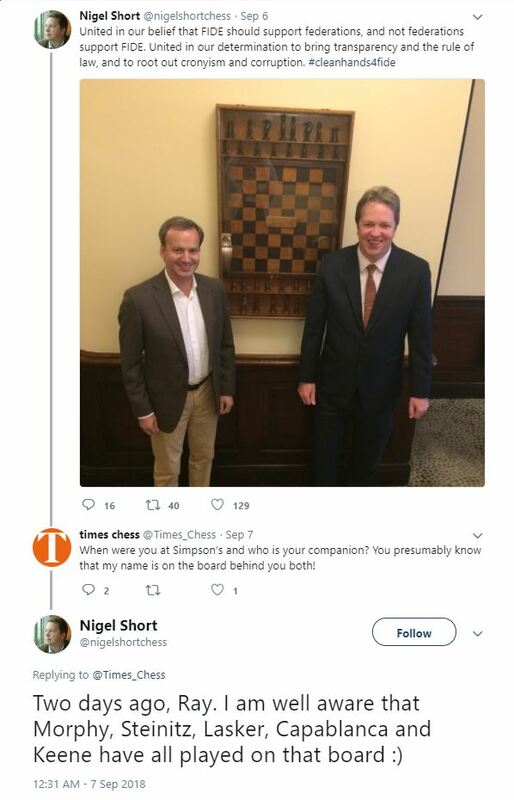 Yet another Keene shambles over the basic history of the world chess championship. ‘in fact i started out as a very positional player indeed and i made a conscious effort to improve my tactics. a lot of the whingeing about my style was from people like ritson morry who had their own axes to grind-i write about this in my forthcoming book on petrosian-in the context of the criticisms levelled against petrosian in the soviet press after the 1956 candidates tournament. ‘a report which more or less failed to mention me’: on page 464 of the BCM there was a complete crosstable, and in Ritson Morry’s report Mr Keene’s name appeared a further nine times on the same page. ‘apart from publishing my only loss’: the report also gave Mr Keene’s win against Hutchings. Raymond Keene often refers to memory, though never to his own uniquely selective one. For Kramnik read Anand. For Topalov read Kramnik. Nobody who asserts that Raymond Keene has credibility has credibility. Man versus Machine was brought out by H3 Publications in the United States shortly after Kasparov was defeated by Deep Blue in New York in May 1997. 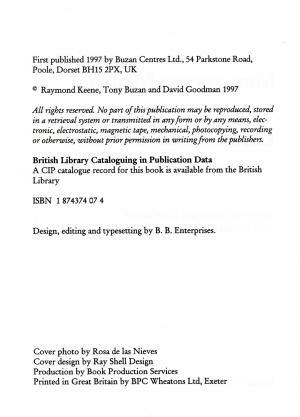 The co-authors (mentioned on the imprint page with regard to ‘entire contents copyright’) were named as David Goodman and Raymond Keene. Apart from a few differences in topping and tailing, the identical book was published in the United Kingdom by Buzan Centres. That edition specified Tony Buzan as a co-author, even though his name had appeared nowhere in the US book. 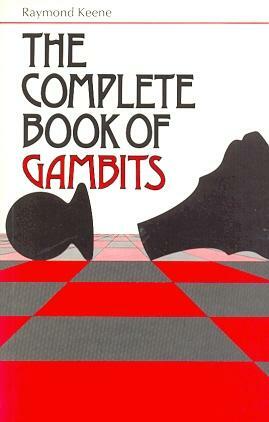 Raymond Keene: a chess combination of Falstaff, Tartuffe, Gaston Lagaffe, Walter Mitty and the Artful Dodger. A poacher masquerading as lord of the manor. As long ago as 1991 he was deploring ‘The Decline of British Chess’ (on pages 20-23 of the January 1991 BCM). His article prompted exchanges in that publication (March 1991, pages 114-115 and April 1991, page 171) and brought him a hands-down victory (against, it must be said, feeble opposition). The entire thrust of Raymond Keene’s remarks was, once again, a gross distortion. John Nunn’s article in 1991 (not 1990) was not about predictions and what could or could not be foreseen; it concerned the situation (factual and statistical) of British chess at the time and over the previous decade. Raymond Keene is not a clever man, and no amount of glibness and guile can conceal that. Above are pages 128-129 of Magnus Carlsen – Viswanathan Anand 2014 Re-Match for the World Chess Championship by Raymond Keene (Bronx, 2014). The book has well over 100 similar diagrams. The only reason to buy a book by Raymond Keene is to warn others not to. People who call Raymond Keene ‘controversial’ are over 30 years behind the times. Many so-called journalists, from Raymond Keene upwards, have written about Nigel Short’s ‘Vive la Différence’ article without bothering to read it, but it cannot be assumed that they, or the hordes of unpaid opinionizers on-line, would have had anything worth writing even if they had read it. A reviewer whose own volumes are notorious for blunders and other defects (plagiarism, for instance) should be neither reviewing nor authoring. Nor, of course, should any writer wish to quote favourable opinions received from such a reviewer. T. Harding rushing to cite R. Keene’s fulsome praise of his Blackburne book was a pathetic spectacle. Having just seen, for once in a long while, a copy of the Times (London), we note that Raymond Keene’s column is still shambling along with its trademark mix of inaccuracy, superficiality and cronyism. Oldřich Důras died in 1957. The 1942 tournament marked his 60th birthday. Concerning Raymond Keene’s treatment of ‘hanging pawns’ (the origin of the term), see C.N. 9941. In reality, it has long been common knowledge that Philidor died on 31 August; C.N. 6006 pointed out that “there was doubt about the correct date until the mid-1920s”. George Cadden’s article on pages 357-362 of the June 2016 BCM, an interesting read, made no claim to have discovered anything new about the date. Mr Urcan’s article is entitled ‘Keene, the Gaffe Machine’. ‘When the Russian Master, Eugene Alexandrovich Znosko-Borovsky, published a booklet entitled Capablanca’s Mistakes, Capa was not slow to announce that he had tried to write a book called Znosko-Borovsky’s Good Moves, but had renounced the project in despair at the lack of material. ‘When the Russian chess master, Eugène Znosko-Borovsky, published a booklet entitled Capablanca’s Mistakes, Capa was not slow to announce that he had tried to write a book called Znosko-Borovsky’s Good Moves, but had renounced the project in despair at the lack of material. 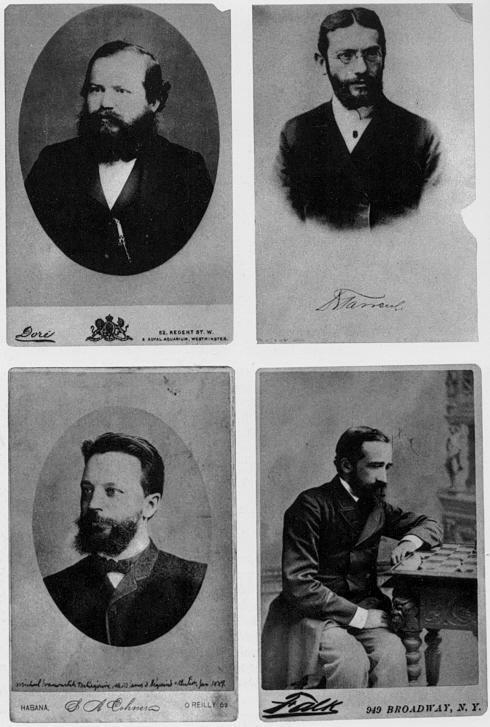 ‘When the Russian chess master, Eugène Alexandrovich Znosko-Borovsky, published a booklet entitled Capablanca’s Mistakes, Capa was not slow to announce that he had tried to write a book called Znosko-Borovsky’s Good Moves, but had renounced the project in despair at the lack of material. Raymond Keene, on page 58 of Carlsen-Anand Match for the World Chess Championship (Bronx, 2013). 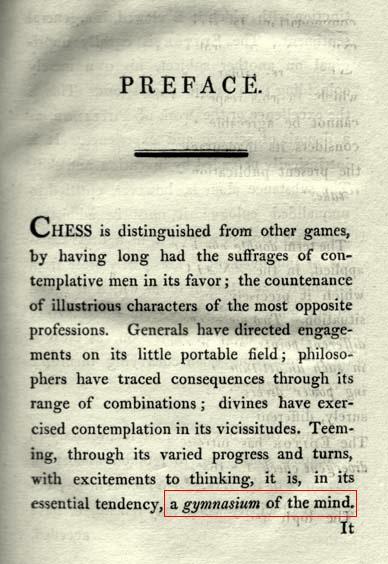 As regards the second paragraph in each of those seven passages, the uncredited writer of the ‘lucid crystal clarity’ remark was Harry Golombek, on page ix of Capablanca’s Hundred Best Games of Chess. Raymond Keene’s inability to recognize Arkady Dvorkovich is as pitiful as his pride in the defilement of the Simpson’s-in-the-Strand chessboard (as shown on a Kingpin webpage). Anderssen’s opponent in the Immortal Game ‘of London 1851’ was Kieseritzky, a name which Raymond Keene has persisted in misspelling for decades. The Evergreen Game was not ‘against the pseudonymous Dufresne (in reality the German player E.S. Freund)’. Dufresne was his name, and E.S. Freund was his pseudonym. Raymond Keene made the same obvious gaffe 30 years ago, on page 136 of his Pocket Book of Chess (London, 1988), as pointed out in C.N. 10155. 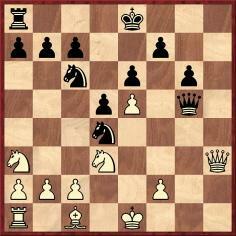 Anderssen v Dufresne was not played in 1856. Our feature article on the game shows that it was published on pages 338-339 of the September 1852 Deutsche Schachzeitung. Anderssen v Zukertort was played in Barmen, not Breslau. Even without primary sources, a quick glance at, for instance, The Oxford Companion to Chess by D. Hooper and K. Whyld (Oxford, 1992) would have sufficed to avoid all these elementary blunders. 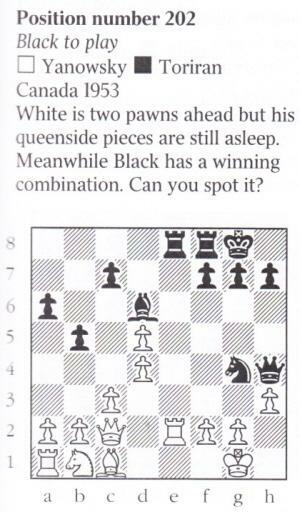 Page 35 of The Brain Games World Chess Championship by Raymond Keene and Don Morris (London, 2000). 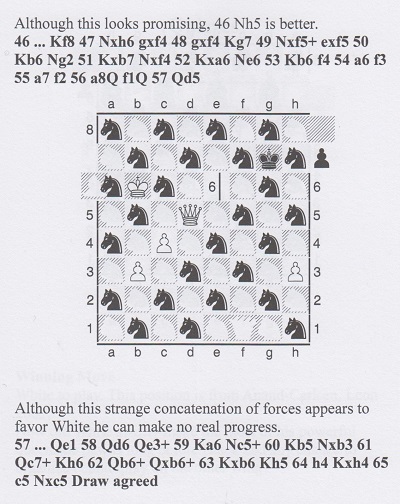 Page 178 of Samurai Chess by Michael Gelb and Raymond Keene (London, 1997). 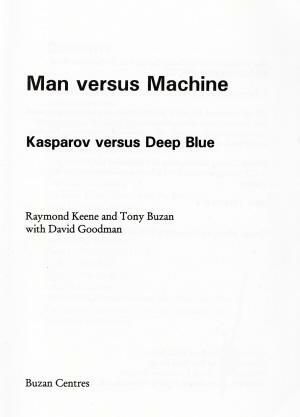 Page 21 of part 5 of Raymond Keene’s Men of War publication for The Times during the 1993 Kasparov-Short match. 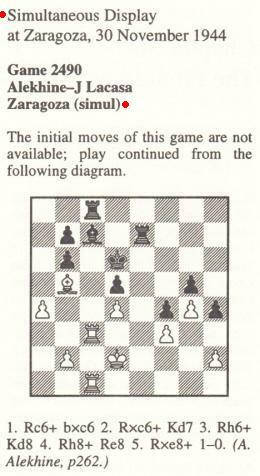 Page 72 of Chess for Absolute Beginners by Raymond Keene (London, 1993). 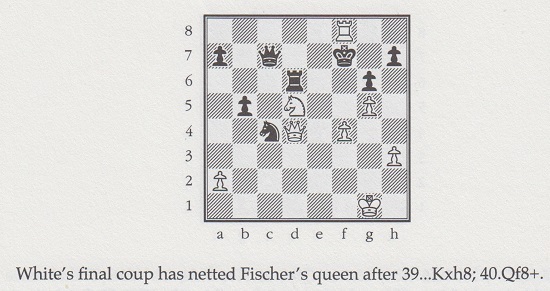 Page 10 of Fischer-Spassky II by Raymond Keene (London, 1992). 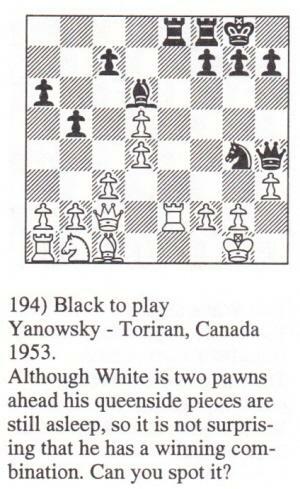 Page 96 of Chess An Illustrated History by Raymond Keene (London, 1990). Page 223 of Warriors of the Mind by Raymond Keene and Nathan Divinsky (Brighton, 1989). 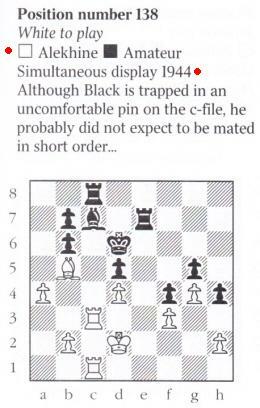 Page 107 of Carlsen-Anand Match for the World Chess Championship by Raymond Keene (New York, 2013). Page 25 of Battle of Bonn by Raymond Keene and Eric Schiller (2008). Page 50 of Vishy’s Victory by Raymond Keene (2007). 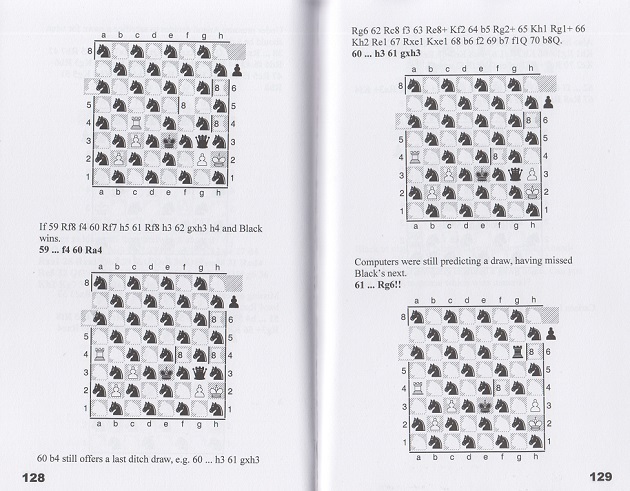 Page 58 of World Chess Championship Kramnik vs. Leko by Raymond Keene (Aylesbeare, 2004). In Raymond Keene’s output no waste ever goes to waste. He is not so much a writer as a repackager. Latest update: 24 January 2019.